Ever since becoming a mama, I knew I wanted to teach my children Bible verses throughout their whole lives. I think it's easy to think that they are too hard to learn and memorize, or that kids won't understand them anyway, so what's the point? I think this is far from the truth! If you've spent any amount of time with a toddler, I'm sure you know that their little brains are sponges! When my oldest daughter was not quite 2, I thought it would be a good time to start working on memorizing a Bible verse with her. She was talking well, memorizing songs, reciting books, remembering things, and had lots of interest in God and the Bible. I wasn't sure if it would take a month of talking about the verse several times a day or not, but she had it memorized in less than a week! I think it was closer to 2 or 3 days. The way that I went about it could probably be a whole post in and of itself (which I'd be happy to write if anyone is curious! ), but basically I incorporated it into her life. This continues to be the way I teach her new verses. I relate it to something she can understand. In this case, the verse was Proverbs 17:17 "A friend loves at all times". That one is really easy to teach kids because you can incorporate it by saying things like "Please don't push your friend. Do you remember what the Bible says? A friend loves at all times!" Then I would slowly add in the reference. When she first learned it, I would start it off for her by saying "Proverbs 17:17 says A friend..." then she would finish it. A lot of the time I would tell her the verses in the car when we were driving, just to have something to do! 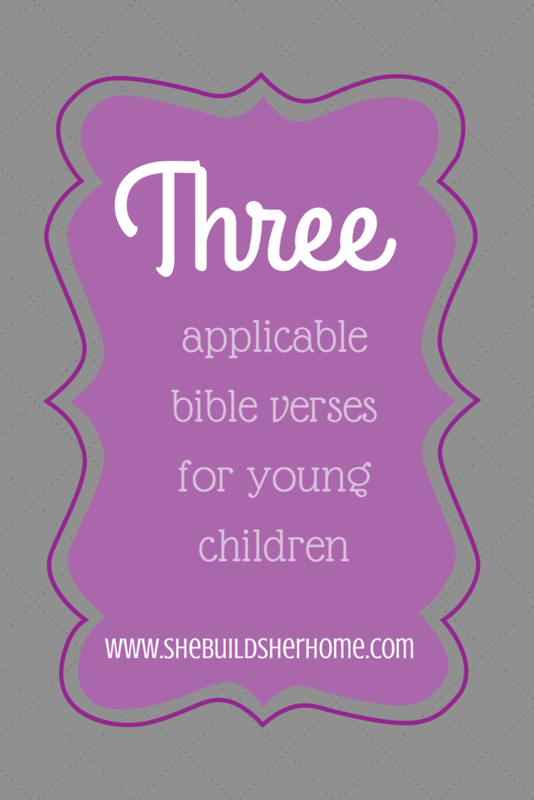 Here are three easy, and applicable Bible verses that I feel you can teach children as young as age 2 or so (maybe earlier or later depending on your child). We have found all 3 of these verses to be relatable to our toddler. The Proverbs verse is great, because kids are learning how to be kind to other people, and what it means to be a good friend. The verse in Colossians has been wonderful for our family, to explain to our daughter WHY it's important that she does what we ask of her. And Philippians 2:14 is awesome for teaching children not to argue with you when you ask them to do something, or to whine about things. Do you have any verses you would add to this list?! We are constantly finding new verses we want to teach to our children!